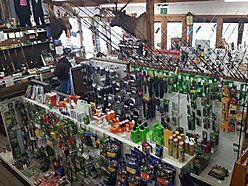 Established in 1975, this full service sporting goods business has been a mainstay in Grangeville, ID for over 40 years now. The business includes an inventory of guns, ammo, fishing, hunting, backpacking, clothing, footwear, camping, reloading and the list goes on. Anything related to outdoor adventure. Large inventory included in sale along with outdoor reader board. Owner is retiring due to health. Will train. Business only. Contact All Around Realty for your private showing today at 208-983-7878. Priced at $350,000.